My hometown is Kangeyam, a small town near Tirupur in the state of Tamil Nadu,India. It falls in the intersection of very busy routes like Coimbatore-Trichy, Tirupur-Thanjavur and Salem/Erode-Palani. So the town hosts numerous bakeries and hotels. One such hotel is Gayathri which is located very opposite to the Kangeyam bus stand. Unlike metros or cities, it’s not common practice for people of our town to go to hotel as family. We always get take-home parcels from couple of hotels whenever we feel like skipping the regular idly/dosa for dinner. Dosas, Uttapams and Parottas are still wrapped in banana leaves and an outer wrap with newspapers, tied together with a twine. They don’t use aluminium foils. And that’s what I love about those places. People bring a koodai a.k.a wired tote to get the parcel and don’t use plastic covers. And I’m telling you, the aroma that comes of the hot parotta wrapped in banana leaves when you open the parcel, is just fabulous! Now, living in Kuwait, I can only dream of the Gayathri parotta and mentally hog! We buy Kerala parottas from the Indian restaurant which is right at the basement of our apartment (how easy,huh?) once in a while whenever the cravings for Gayathri parottas go high. 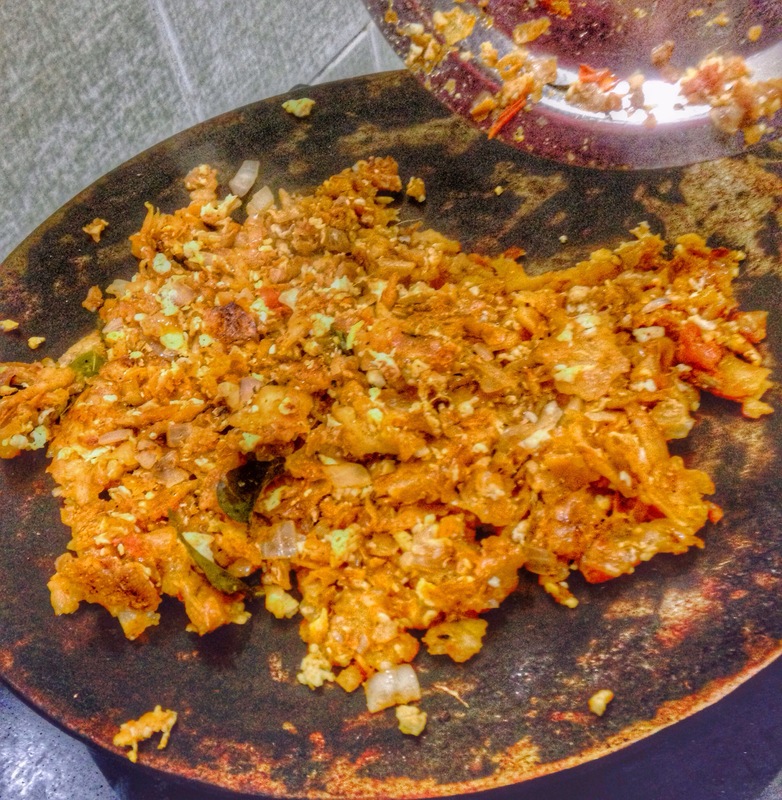 I’m sharing here the steps to make egg kothu parotta at home from the ready-made plain parottas. Break parottas roughly into pieces. In most of the Indian restaurants, you will get a plain gravy a.k.a salna along with the parottas; that is the main ingredient to get the restaurant style kothu parotta. Heat a thick-based flat tawa. I used my iron dosa tawa for the purpose. Sprinkle few teaspoons of oil. Add the chopped onions and curry leaves and fry till onions turn brown. Add the tomatoes and cook for a minute. Now add the plain gravy and mix everything together. Add the required salt for the dish. Throw the parotta pieces and toss to coat them with the gravy. Break the eggs into the tawa and mix to scramble and cook them. Use a sharp-edged laddle so that you can mince the parotta. I used a sharp-edged plate for the same. Increase the heat,sprinkle the black pepper powder and add the plain gravy (if you have any left) and do a final toss. Transfer to a serving bowl or plate and garnish with fresh coriander leaves. If you don’t have the plain gravy, use an extra tomato and garam masala powder. Cubes of capsicum, cooked green peas or channa dhal can be added to make it even more colorful and tasteful. I personally prefer sans these. 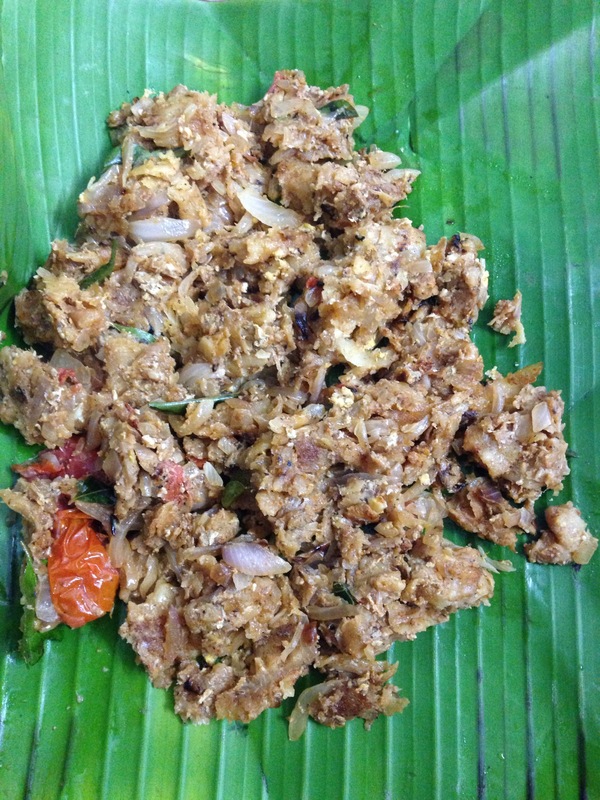 And below is the Gayathri egg kothu parotta for you!